Trend Micro has flagged this backdoor as noteworthy due to the increased potential for damage, propagation, or both, that it possesses. Specifically, it is circulating and building armies (drones) especially in Vietnam and the APAC region. This backdoor may be unknowingly downloaded by a user while visiting malicious websites. It drops a non malicious setup file called vpskeys, which is a Vietnamese keyboard driver. It then runs the file to avoid suspicion. 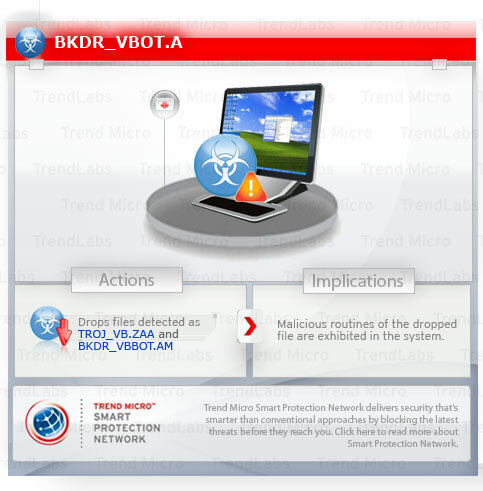 Scan your computer with your Trend Micro product to delete files detected as BKDR_VBOT.A. If the detected files have already been cleaned, deleted, or quarantined by your Trend Micro product, no further step is required. You may opt to simply delete the quarantined files. Please check this Knowledge Base page for more information.